Bob Doyle | Come Here To Me! 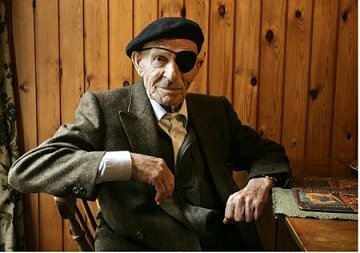 Below is the excellent 1976 RTÉ documentary on Irish involvement in the Spanish Civil War (Spanish Anti-Fascist War, 1936-1939) uploaded by our good friend and grandson of brigadista Michael O’Riordain, Luke in the last couple of days. Presented and produced by Cathal O’Shannon, the documentary features contributions both from Irishmen who fought for the International Brigades on the Republican side and those who travelled with Blueshirt Eoin O’Duffy’s Irish Brigade to support Franco and Fascism. The documentary title was inspired by poet Charlie Donnelly, who remarked that ‘even the olives are bleeding’ shortly before he died fighting for the Republic at the Battle of Jarama in February 1937. The documentary features some amazing footage, including an Eoin O’Duffy address from the balcony of the Ormond Hotel on Dublin’s Ormond Quay. Other notable contributions, apart from those with Michael O’Riordan and his great comrade Bob Doyle, came from Terry Flanagan, ex-baker and Saor Eire member and Alec Digges, a brigadista who returned to Ireland from Spain, before going on to fight in the Second World War, where he lost a leg. 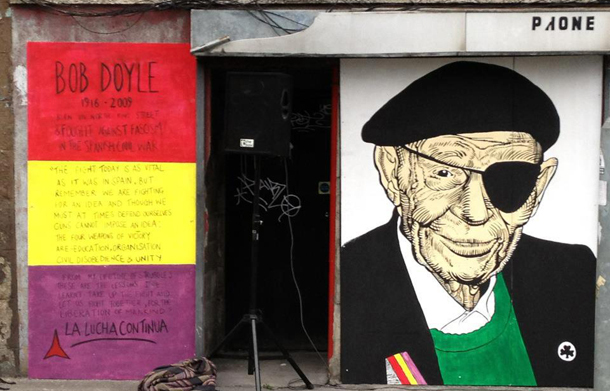 Mural of Brigadista, Bob Doyle, installed on the Cobblestone Bar, Smithfield, (since removed.) From An Phoblacht. On the fascist side, there is contributions, amongst others, from George Timlin, an NCO in the Irish Army who gave his reasons for going to Spain as “the spirit of adventure” and to quote “to oblige a friend… Eoin O’Duffy who wouldn’t have asked me if he didn’t want me to go” and Padraig Quinn, veteran of the War of Independence and the Civil War who, encouraged by the anti-communist sermon of his local bishop, joined Eoin O’Duffy’s legion. Its sometimes easy to forget that there were Irishmen on both sides in an at times brutal war, and this documentary gives a good account of both. The fact a Webley and Colt. 45 Revolver were found by the Gardai behind the shop counter perhaps best indicates the political tension and state of fear at the time. This, and other insightful accounts, can be read on the fantastic ‘Ireland and the Spanish Civil War’ website located here. 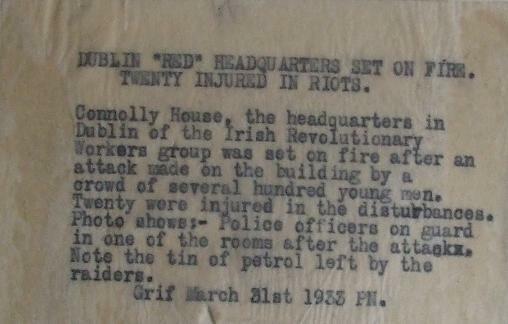 Connolly House, the headquarters in Dublin of the Irish Revolutionary Workers Group was set on fire after an attack made on the building by several hundred young men. Twenty were injured in the disturbances. 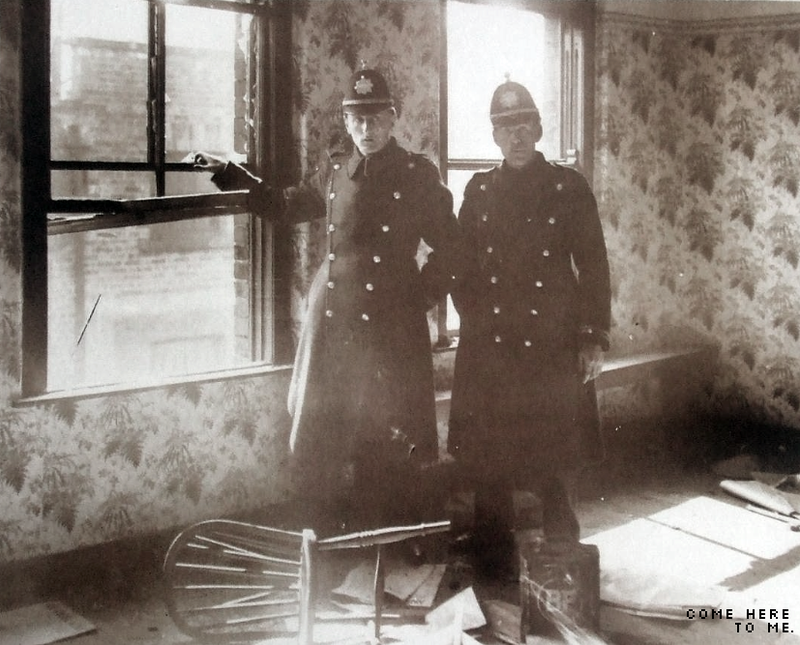 Photo shows:- Police officers on guard in one of the rooms after the attacks. Note the tin of petrol left by the raisers. Grif March 31st 1933 PN. Two stamps on the back of the photograph point to News Media companies in both London and New York. On a lighter note, notice the can of petrol left behind by the mob is ‘BP’, or British Petroleum. You couldn’t make it up. Bob Doyle was an interesting, and very complex character. 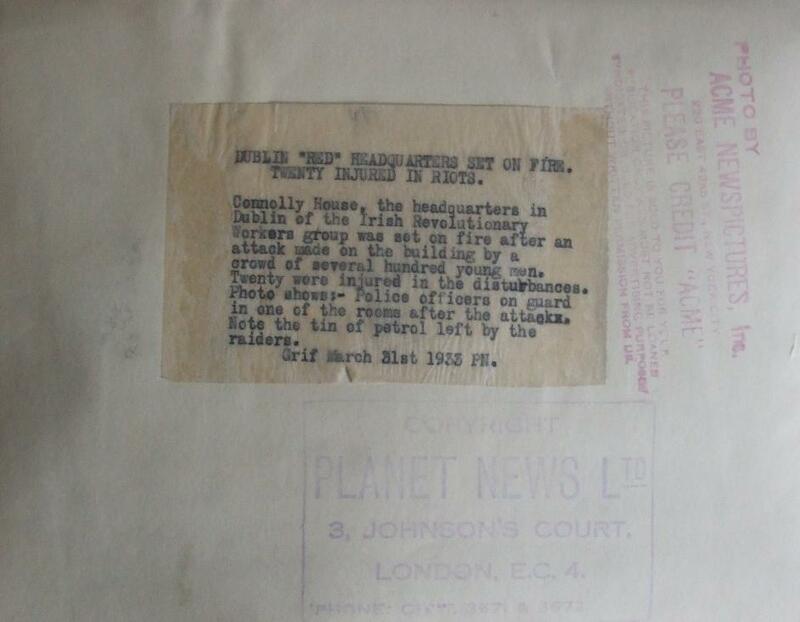 In 1933, a mob besieged Connolly House in Dublin. Connolly House of course was the home of the Communist Party of Ireland, and the hysteria was religious by nature. On the 29th of March, this crowd proceeded to set fire to the building, with Gardaí estimating the crowd to be in the region of five to six thousand people. One of those people was a certain Mr. Bob Doyle. Bob would later end up joining the Dublin IRA, and joining the International Brigades in Spain. Not an easy task mind, as to get there he endured quite the hard life. Learning that the last group to depart for Spain from Ireland were gone, he decided to “get there on his own steam”, staying in Salvation Army shelters like that in Great Peter Street, Westminster. He ended up getting a job as a kitchen porter (“like Ho Chi Minh” he observes, in Max Arthurs book!) and even spent time in Marseilles sleeping on park benches and later hoped a ship to Spain, making a jump for the jetty and pulling a runner as the captain of the shop shouted “POLICIA!” at the top of his lungs. Some journey before seeing a single rifle. During the Notting Hill race riots of 1958, Doyle, who lived in the area, organised patrols to protect immigrant West Indians as well as a demonstration which he headed carrying a placard saying “No Little Rock Here”. He also drew regular Sunday crowds of up to 600 at Speakers’ Corner, where he would attract attention by setting fire to newspapers and saying “That’s what I think of the capitalist press”. Trips to Spain were an opportunity to distribute anti-Franco leaflets: he scattered them in Madrid among football crowds and on buses before making a swift getaway. ‘Brigadista’ is the title of not alone Doyles autobiography (A fantastic read in itself) but also a recorded interview with Bob. His last one, in fact. 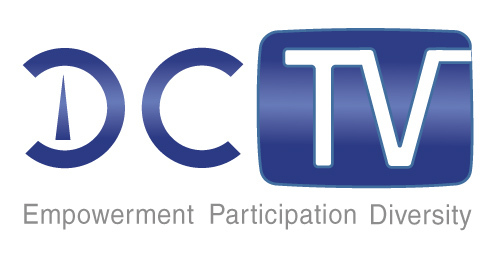 Recorded by Dublin Community Television (DCTV) , the conversation took place during Doyles last visit to Dublin (He spent his later years living in London) This interview is essential viewing. A one on one conversation with Trade Unionist Mick O’ Reily, Doyle discusses not alone Spain but also Dublin and London.